Today Mary and I went up to put the Lowrance 1000 through it's paces. After the initial mounting to the yoke at the pilots position, we decided for a better view of the instruments to re-mount on the right side yoke and angle towards me (the left) . This position was ok, but I think the next time out we will mount it in front of me so I can see it better. First area was out near 40N Chester County, actually about 8 miles or so south heading in a westerly direction. I didn't like all the haze and decided to make it a landing practice session instead. I turned around to the East and tracked MXE on a 90* inbound radial. Giving the GPS a quick glance I notice it has us pointing to the south not completing my 180* turn back to the east. For some reason we lost our track, it looks like we will need the antenna. No problem, tracking MXE fine and really just coming back from the practice area I see my water towers for the 45* entry to the 27 left down wind pattern. A nice smooth landing and taxi back to blast off for a few more rounds. Mary reaches back to my flight bag and grabs the antenna then plugs it in the Lowrance 1000. Following traffic for departure ( a smokin'' Mooney, dang it looked sweet) we were # 2 to go. As we roll into position I have visual on the Mooney getting ready to turn crosswind. We rotate and climb out to 1200 minding the noise abatement 280* to stay clear of over flying the mansion on the left and housing on the right. Calling my crosswind turn and power back to hold steady at 1500' I glance over and notice the GPS tracking solid. As I am about to turn downwind I hear the Mooney call out his turn to base, I follow his call with 2746C turning base 27.......That's right big ole' brain fart...I heard his call at it rolled right out between the teeth. He quickly asked if I had visual I said no contact and that I am turning downwind not base, with an apology. I felt like a dope. Mary wasn't sure what I had done, I was beating myself up about it and I think it made her nervous like I really screwed something up. Made me nervous, he got that right, I told Gary that I probably would not have know he made a mistake except for when he went OPPSSS and kept saying what a dope he was!!!! And since I really did pay attention to his stories about his lessons with Bill, I knew that it was important to quickly recovery and fly the plane. I explained what I had done and she used my favorite lines...flush it down the toilet, let it go. She then said just fly the plane......great it's like having my CFI along 24/7 . She was right as he was right, why bother to beat yourself up, move on. So I did of course moving on to my landing checklist and noticing that I am wide of the pattern and need to get it together. Five landings in the book today and only one with a tad bit of balloon, guess which one. It was a little disappointing that all we did was landings, but considering the weather this was my opportunity to get use to landings, again, and again, and again and again…………ok, I think I have it now. Ok, with GPS issues resolved and Mary ok in either plane we will attempt a second trip next weekend. If the Little league baseball team wins the state tournament tonight I may be flying to Bristol, CT. I checked out 4B8 Robertson Field just southwest of KBDL Bradley International as my point of destination. I will call this week and check out car rentals and aircraft availability. After a long weekend of overcast weather Monday was looking like the day to fly. 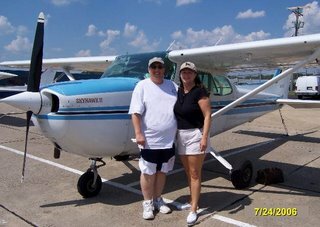 I called the flight school (TAS) and booked a Cessna 172 for an afternoon of fun and adventure with my Bride. Yes, today was our introduction to aviation as a husband and wife team. This is not our first time flying together, we logged time in Las Vegas (with a CFI on board) and Mary joined me on my night cross country to Jake Arner Memorial with my CFI. 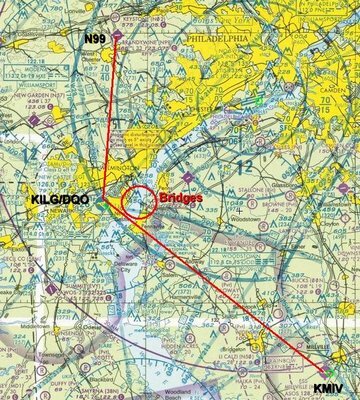 My flight plan was for N99 to KGED, Sussex County (Georgetown). With 2746C already booked for the afternoon we had to rent N65021 on a shorter time frame. We had the aircraft all to ourselves from 1:00 to 4:00. With the time available and aircraft change we decided to make Millville our first run. A quick plan update on the AOPA flight planner with winds aloft and weather completed I only needed to update my wx briefing with Williamsport FSS. FSS says good to go VFR and have fun on first flight with your new ticket, I pass along my thanks and confirm, it will be a blast! I could say nothing prepared me for how I was feeling about today, but then again it’s like being on your first date, your so excited but at the same time cautious……not sure what to expect yet knowing your in for the ride of your life. We talked and dreamed about this day for a while now and then here it is, right in front of us. I have supported Gary every step of the way and he has always said that he never would have been able to pursue his dream if I could not be part of it. How lucky am I!!!!! Pre flight complete and buckled in I get 021 started. I go through all my checklists out loud so Mary can follow along. I also find myself paying attention to the explanation for the break check and once to the run up area the reason for the increase in power and no movement. Hearing Gary go through the pre-flight was a little unsettling along with the butterflies in my stomach…….but within seconds that was gone as we started to roll for take off. An audible check of systems and the run up is finished. We start our roll to runway 27 for departure while looking for traffic on base and final. Once at the hold short I go through my last safety checks, fuel, trim, flaps, mixture, transponder. Announcing my departure on 27 we roll into position and head out. Nice and smooth, maintain heading for noise abatement we are climbing out. Mary made a comment how cool it looked! Once we were in the air the butterflies were gone and the excitement of the view took over, just Gary and me, what a rush. No GPS on board today, it's in the shop for repairs. I confirm my heading inbound for the DQO VOR and announce leaving Brandywine to the south. 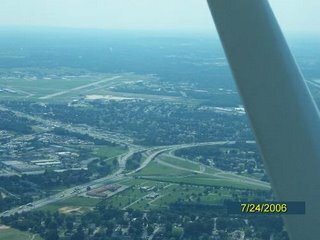 I climb to 2800, good for pictures and above the Class Delta at Wilmington. We are also under the Class Bravo shelf 70/40 outer ring of Philadelphia. The Delaware Memorial Bridges in sight and Wilmington Airport lined up for a very long final to 19, we are headed in the right direction. I call to advise Wilmington Tower that I am transitioning above the Dleta airspace NW to SE at 2800, they confirm. I know it was not needed since I was above the 2600 ceiling, but sometimes it gets busy there and knowing I am on frequency and aware of my location may help the guys in the tower out. Crossing the Delaware it was a bit bumpy but not to terribly bad. Not terribly bad, who is he kidding!!! It took only a few minutes of closing my eyes then I started enjoy the sensation. Intercepting the 140* outbound radial of DQO VOR was easy enough and now tracking to Millville. Nice view today as I look towards the South-South East over the Delaware Bay. There are a few tankers lined up waiting to deliver the goods. Mary and I are taking in all the sights, enjoying the flight when she says "traffic passing under us on her side, helicopter", I could not see it. Good eyes! and I thank her for the spot. Bridgeton is now in view with KMIV just of in the distance. As we listen to 123.65 CTAF for Millvile we spot the aircraft on short final for r/w 27 and the #2 turning from downwind to base. I announce my position as 5 north-west of the field to cross at midfield NW to SE and reposition for a 45* to enter left downwind for 27. I turn back towards the east and loop in for a nice 45* and report a 2 mile entry followed by the downwind entry call. Last checks for landing, fuel, mixture flaps, lights check, and carb heat already on for decent to pattern altitude. What a nice landing, smooth as could be a real greaser as they say! Mary said, nice, real nice, Bill should have been there to see it. He was in my mind, I heard him, nose up, nose up hold it off. I know that Gary wanted our first landing to be perfect and it was, he did a superb job smooth as silk, I was so proud of him…………and grateful too!! After parking and getting 021 secured I followed Mary into Antino's for lunch. Ahhhh...what a gal already had my ice tea waiting. A very nice lunch, Lobster Bisque soup and a BLT on home made Pita bread (good stuff). I was thrilled that Antino’s was our first lunch stop, I’m a huge fan!!!! Lunch was followed by a short stroll to Big Sky Aviation to say hello to friends. The folks are so nice at Big Sky, they took the time to take a picture of Mary and I for the flight scrap book, how cool is that. I would like to thank Beth for sharing our excitement and allowing us to be the tourist along with taking our picture for us. A quick call to Millville radio to inform them I am at the Big Sky Ramp and ready for departure VFR to the north. I confirm traffic advisory, runway in use and ALT setting. 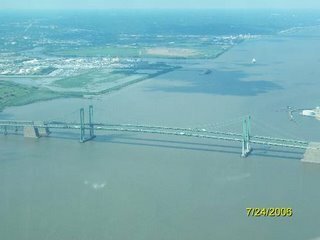 we pass over the Delaware memorial Bridges. Mary and I track North along Concord Pike (Rt. 202)to pick out all the places we frequent. Hmmm, oddly enough they are places to shop and eat. The Dupont Mansion is off to our 9:00 and the Childrens Hospital Alfred I. DuPont Memorial tower is at our 3:00, very cool from the air. I catch a glimpse of the Smithbridge road covered bridge, a project I had the good fortune of having spent some time covering while working at the Delaware DOT. Crusing along the Brandywine and making way for Modena (MXE) our journey is almost complete. The familar twin water towers acting as the gateway to a 45* entry for downwind runway 27 clues me to announce my position. Brandywine traffic, Cessna 65021 on a 4 mile 45* from the SW for left downwind 27 Brandywine. Not a word on the radio, pattern is quiet. I flow through the landing checks, hold my pattern altitude and turn downwind, base then final. Nice and easy, good headwind as I check the windsock for the last time followed by a nice flair and gentle chirps......home sweet home. Another nice landing with a tad of movement to the right but pretty much on center. Calling clear we taxi to the tie down and secure 65021. I feel so much better getting the first one in the books. I honestly can say I was a bit nervous with the Bride on board for the flight to Millville, but coming home I was more at ease. My CFI was at the school as we walked in, he was happy to see us taking to the sky. We are not sure about our next trip. I guess as always wx dependant, we may try to get to Cape May for a day on the Beach and crossing the bay for dinner at KGED before heading north to home. Planning that first flight as a "New Pilot" ! Mary and I have discussed many different locations for that "first flight". I would like to head north to KWBW (Wilkes-Barre, Wyoming Valley) since this is where my family is from. We also would like to go to Block Island, one of my Brides favorite places. I think the Island will hold for now and we may start off with a short trip to Cape May, NJ and visit one of our favorite restaurants the Oyster Bay. A short hop to Cape May from Brandywine Airport, 40 minutes, a great dinner and a stroll along main street along with visiting the few shops on the boardwalk. I was trying to get away today (Saturday) but the wx looks like a "no-go" so maybe next weekend. I think Monday we will try for an hour or two of checking out the local sights after an early departure from work! When we post I think we will do as a few other husband wife traveler's do and that is changing up the type set. I'll continue in this format while Mary can post in Italics. This will give us a chance to present both sides of the adventure, left seat and right seat. We hope to be posting details soon. The inspiration to keep the travel journal now that flight lessons are completed has come from various journals I have read and enjoyed over the last year. 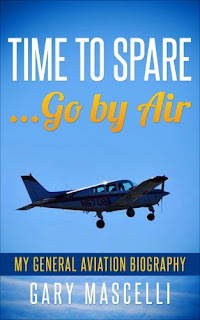 A few of my favorites are; Bo and Sandra Boggs, "Flights of the Mouse" and Phil and Nancy Verghese, "P Factor" both great reads if you have some time. As a newly minted Private Pilot I look forward to adventures and destinations that Mary and I can share with our friends! Yes, I finally hold that white slip in hand, I'm a pilot! As I sit here only 17 hours post checkride I am still trying to get a handle on it all. I can't help but think of all the times I asked myself what the heck am I doing here, this crosswind stuff is crazy or the many many landings and even wondering if I would make it at all. Wow, some frustrating times indeed. I also think about wanting this so bad that I could almost reach out and grab it, heck, take it if I had to. Growing up my folks were very supportive, I honestly can not remember them ever saying "you can't do that" We were always encouraged to do things as long as we gave it everything we had. I also am so glad we were not told we were the "best" at something or so much better then most, quite the opposite at times. At least if it didn't work out I didn't have far to fall. As an example in baseball I followed in the footsteps of my brother with league play but he was a very good player and an awesome teacher of the game. I was an average player who was better because of the coaching from my Pop and help from my brother. What I am saying is that encouragement to drive for a goal helped me get this ticket. Thanks to my Bride Mary for her support, encouragement and sharing in my passion for flight. Also, I could not have made it without my CFI Bill Mitman, his patience, challenging techniques (covering everything in the cockpit with his suit jacket, so I can fly by the ol' seat of the pants) and consistent work in pushing me with regs and what if's finally got me to this point. The oral portion of the checkride went fairly smooth. I had everything placed in neat stacks on the table , application and test score, log book, to do list (Examiners stack), flight plan, sectional chart, airport diagrams and taxi diagrams, (My stack), All records for 46C neatly arranged and tabbed along with FAR/AIM tabbed and ready and the Pilots information manual. The Q&A was pretty open format more of a hangar flying session feeling than a test. I answered all but two questions and one was a partial correct. Is a radio operators license required, I said no but but I was given an example of Canada and it's requirements. The other question was an airspace example, Class Bravo how do I enter. I proceeded to go through the calls and said everything but the word Cleared or clearance. The Examiner looked up at me and asked me if I was taught that since I was so passionate about my answer. At this point I thought oh brother.....I went in the deep end. I said I am positive I was taught correctly, but I may have screwed the answer up. We went through it again and the key was hearing cleared. Lesson learned don't assume. After some really great points about testing and the topics we covered I heard the magic words..."Let's go flying". ......I'm halfway home! The flying portion went ok. Soft and short field take off's, go round, engine out all went well. Power off stall and power on were ok with the "whoa" recommendation of not dropping as far below the horizon. No sneaky secondary stalls, and he agreed but didn't said no need to drop nose as far as I did. VOR work was fine to my first checkpoint and to get me home to Brandywine. All in all not to bad even though I was nervous. My final landing was a shortfield back at Brandywine. I was at 55 kts and he mentioned to watch my speed. I was holding steady and on short final working the throttle to drag it on in. I touched down and brought up the flaps with a call out for simulated heavy breaking. Not to bad he said but why didn't you use the last notch of flaps? I almost died......thinking did I get here and now not make it ??? He said you did fine but really had to work the throttle to do it, let the flaps help you. I was honest and said I really thought I had added the last notch. As I finished my after landing checks and proceeded to the tie down we talked about airplanes. Once out and 46C secure he asked me to check my information and sign across the top of the page. WoooooHoooooo........I am a PILOT!!!! He gave me a pen with his info in case I don't get my license in the 120 day period and that went right in the log book. We closed with a handshake and I thanked him for his time and making the trip out to N99. I passed on a bottle of cold water from my cooler stored in the truck and then helped him jump start his aircraft since his new battery went dead. I am glad it's complete, now it's time for the Bride and I to hit the skyways!!! A new start to a new day! With the lack luster oral test prep behind me and the thoughts of nailing down answers I need to know I was set on having fun today. My ride to the airport had me thinking how I can run multi million dollar projects, deal with contractors, manage people, budgets and staff without flinching yet answering questions about something I love to do had me literally in knots. .....I needed to step back and take stock when I looked in the mirror this morning and I've decided I am ready to have at it. Sort of like sitting in the shoot ready for the gate to kick open when you pull that hat down grit the teeth and give it "let's go boys" and your off!!! Well I'm off on my Mock checkride. It was a fantastic morning. Off to KILG or at least in that general direction. My "new" CFI directs me to climb to 2200 and direct to MXE VOR. Okie Dokie, departing runway 27 and turning to the crosswind I exit the area on a 45* for MXE. I am directed to head to the practice area once the VOR flips from TO to From. No problem, clear right and a gentle turn out to the practice area west of MXE. Once on course my CFI asks me to perform steep bank turns and that I can start now. Hmmmm......not yet, I advise that I would like to be clear of the community below and head farther to my west over the farmland, he nods with approval. Once on station I said I am ready so lest begin with a clearing turn to check for traffic. A 360* search shows the area is clear. I choose a point and bug the heading slowing to a safe maneuvering speed and begin my steep turns left with a roll right into my right turn hitting the heading on target. ALT, speed and bank angle were good. On to slow flight.....This went very well and I continued right into a power off stall when I was ready. This went well with a note to self power off means power all the way off......I held in about 1400, but recovery was good. Cleaned up and back at cruise I went through the power on stall. Throttle back to 1500 holding nose level to around 70 kts then 85% power while pitching the aircraft nose high, holding right rudder to keep the ball centered. Ok, stall horn, yoke forward to break the stall, holding just below horizon to gain speed and recover back to cruise. I repositioned to the East to keep my location over the farmland when he pulls the throttle. Ok I need to be smooth here with the ABC's. Airspeed 65 kts, 6 swipes on the trim wheel more or less, looking for best field ahhhhhh.......new garden N57 is just to my south. Turning to N57 I flow through the check list, checking fuel tanks, fuel on, mixture, throttle, fuel pump, restart. I then tune for N57 to announce simulated engine out landing and cross the approach of runway 6 at 2200. I stated that I would have dialed in 7700 and called the mayday with location but with the field here I want to concentrate on getting there. I begin a turn out to my right to reposition for a turn to final. Now looking into the sun and trying to find the runway I struggled to block the sun glare and align myself. Adding flaps with plenty to get me there I add in another 10* line up add the last 10* on short fianl making a nice landing. Lesson learned form my CFI, keep that runway in sight with left spirals over the field down to final, utilizing the turns to decrease my ALT. He also said good outcome anyway....just food for thought. Of course he is right, why turn away from where I have to get to and fight that sun at a most critical time. A softfield takeoff and turn north back to the practice area I am instructed to make a softfield landing back at N99. I tune in the MXE VOR track inbound and then outbound on the 55* radial for the 4 mile 45* to left downwind 27. Um...hello? helps to switch the radio back to N99 . Landings were fine, soft and short. My landing with no flaps was to fast so I went around and gave it another go. A good choice rather then "force it". Ahhh, the second time was the charm as I made better use of my Trim to get me there. Mock ckeckride complete and only some study for the weekend. I will complete my flight plan along with my weight and balance monday morning and pray the stinkin' heat is not to bad. I'm excited! but I know I need work with the oral and I'll be ready Monday!! Quick update on the Maggie girl (Italian Mastiff) , knee surgery complete she is back at home looking like the maggie daisy. Yes, a big ol' plastic lampshade collar to prevent her from removing her staples in the knee and pain patch. The baby girl moaned a bit last night but once back in her bed she was ZZZzzzzz big time. I thought the railroad was back in town !! As if tests are not bad enough.........I have read every test prep, watched the King DVD's at least three times and still could not find the way to explain questions asked at the oral test prep. I felt like a dope and got very frustrated with myself. Some answeres flowed and I think they were the topics related to cross country activities. Chart reading was fine, had no clue what the "48 hours in advance " was in reference to in the special use airspace listings.......I know now! Overall it went fair, I took some notes and really got a good look at what I need to know without thinking. I think (bad move) that I tried to think through the answers to much, at least thats what my CFI was saying ( he is a kind and patient man) I guess I need to review and be able to snap out the answers. I will be ready for Monday. My CFI said if I dont feel right I can cancel, he sensed my frustration with out a doubt. I stated that unless I was puking my guts out I would be there...........I just want to have the "A" game rolling when I do meet. Hmmmm......maybe I need to dig up one of those motivational speeches for the little league kids......or maybe need to just look in the mirror and say I can get this done, no problem, what's this lack of confidence thing going on. Mary, the ever supportive Bride said she has never seen me like this since she met me.......always Mr. confidence with a chip. I have to laugh, she said she has never heard me say "I hope I make it...or I hope I pass" so much. Geezzzz has the pressure of taking this test got to me? It's time, as they say, to pull the hat down tight and hang on for the ride. I've made it through a lot harder things that tested the metal a bunch more then a oral and flight test. I will be reporting in on Monday with ticket in hand ............after I get back from Cape May, where I plan on taking Mary for that first $100 hamburger lunch!!!! Yes, in the air for a third day in a row!! The gal (46C) needed some go go juice again today prior to taking off the triple leash (tie downs). Fuel complete and only a fuel test to finish before I am climbing in. It is really nice out today and I hope to run through a checkride routine. I set up my alternate radio frequency for Chester County (40N). I also set up Nav 1 for DQO (DuPont) VOR at New Castle County Airport and Nav 2 the MXE (Modena) VOR. Com 2 is set up with the AWOS at Chester County in case I want to practice landings or monitor winds. Ok out to the run up for final checks then on to the hold short at runway 27. Last checks for fuel, trim, flaps (set to 10*) , mixture and with a call announcing departure I am off. Softfield departure, nose up, slow starting roll, wide turn increasing speed now aligned for takeoff, heals on floor and away I go! Level, best rate of climb, clear obstacles, take out 10* flaps and continue climb out to 1200. On cross wind I announce a south departure and sure enough Nav 1 set on 190* is on the money. I continue on mentally going through a call for flight following and thinking I best rehearse (in my mind) a call to open my flight plan in case the examiner wants that. Up to 2800 and staying under the outer ring of Class Bravo for Philadelphia I turn west to position south of Chester County but North of New Garden (N57). I swap over to 122.7 (40N) and announce my position as 7 miles to the south-south west and will remain in the area at or about 3000. 40N is busy with traffic so I keep a good look out for traffic while trying not to stray into the area where pilots will be entering the 45* for the left downwind for runway 29. Clearing turns followed by slow flight, steep turns, approach and departure stalls (above 3000) and a run through the engine out procedures has me about ready to head back home. I get myself turned eastbound and swap Nav 1 to the MXE VOR (90* TO) What a nice view today, clear down the Delaware, easy view of Philadelphia and to the north the cooling towers in Pottstown. I can't wait to have my ticket in hand, that's when the real learning will happen along with the fun! Calling out my entry on the 45* for runway 27 I note everything but direction . I re-key the mic and state 46C 5 miles from south west. Into the pattern and decided to try the softfield landing. All went well and the with next circuit I try a go around. Not bad but I rushed to take out that second notch of flaps at about 70 kts instead of best climb angle speed of 60 kts. I can't mess this up on the checkride. The last circuit I just land nice and slow 55kts good for a shortfield but I opt NOT to touch the flaps and decide to spare the brakes. I really concentrated on not slipping today. I wanted to hit every landing on the money without having to slip in, mission accomplished. Mock Checkride on Thursday morning....followed by oral test prep Thursday night. I will try to get one more practice flight in maybe Tuesday night depending if Maggies Vet appointment can be moved to 7:30 p.m.
No traffic this morning as I head to Brandywine, how nice is that. I make my way to N99 while listening to CTAF 123.075 for traffic. It seems that Brandywine is a busy place this a.m. The office was filling up fast as I signed my slip for 46C. Off to pre flight and enjoy the stroll out to the flight line. Last check for me is to sump the fuel. I already know it's low from the in cockpit preflight. The gauge was showing just 10 gallons in the left tank and maybe 14 or 15 in the right tank. Call me Mr. Conservative but I am not trusting that gauge. I walk back down to the office and let them know that 46C needs some go go juice. Finally taxing out to 27 for a west departure. 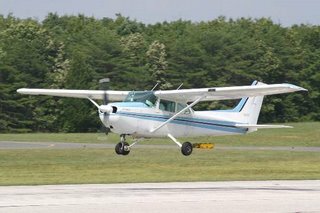 I decide to do a "softfield" take off and add 10* of flaps followed by my call and slow taxi nose high to a wide left turn into position. No stop here, adding full power and launching! Hold it level, best rate of climb (80kts) take out flaps and climb on out to 2500. I practiced clearing turns, slow flight, power on and off stalls and right hand steep bank turns. I was working in the area south of Chester County(about 7 miles south) and advised traffic of such. Back home via the MXE VOR followed by following the 54* radial which puts me on a 4 mile 45* for 27. Traffic has picked up with Cessna 1TB on a 45* for 27 a couple of miles ahead and traffic departing with rotor traffic too. A comment was made on the radio about "welcome to Brandywine international" I thought no kidding as my head was on a swivel like Linda Blair in the Exorcist. A few take off and landings to work on short field landings and soft together with monitoring my airspeed left me feeling comfortable for tomorrows practice. On tap tomorrow will be "going around" practice together with simulated engine out and all flight maneuvers. My mock check ride is going to be on the 13th, I want to be ready. More reporting tomorrow after my noon time workout. Wow, this flying stuff is pretty cool! It feels like I am a new student as I pull up to the airport today. I arrive early and complete my preflight and have some time to watch a few planes in the pattern along with some rotor traffic. My CFI arrives and we get ready to go. He asks, what's on tap for today since I did not fly the two days I had scheduled due to my brain fart. I mis-read the date for my 90 day to expire it was July 11th and I thought it was in June. Ok, that means I could have taken a few flights over the 4th holiday but I didn't remember the school requirement of flying with an instructor within the last 30 days. That date passed on June 25th...... Lesson learned as pilot in command I control my paper work and am the responsible party. I guess it's the same as running my contracts at work, I don't let anyone make decisions or run willie nillie with the budget unless I agree since I am the Project Engineer or in aviation terms the PIC. Today will be soft and short filed take off and landings. I think I remember this (it's only been 3 weeks). N99 has the new taxiway open to runway 9, very smooth and wide......great job Brandywine !! I complete my run up and make the appropriate calls as I begin my nose up roll to takeoff with 10* of flaps. In review a bit to slow on round ing to take off but make better on the following attempts. Leveling off after wheels up and gaining speed in ground effect I hold level as I gain airspeed and raise the flaps as I clear obstacles. Needing to correct for the wind (and slow to do so)I find myself trimming for best rate of climb as I scan the area as push way wide of my pattern. Ugggghhhh.........Correcting course to get back to where I need to be I start to feel it all coming back (notes "start" to feel). Landing speeds are good today notinbg a few drops below 60kts on final for a softfield. My CFI says its not nice to scare the Examiner.....or for that matter give him reason for concern. I make it a point to better control my approach speed. The next few are better and then the dreaded engine out simulation. Not a bad place to happen on downwind, if its going to happen that is, so I proceed with the flow ABCDE......A= Airspeed trim for 65 kts., B= best field , I'm there, C= checklists, I start with fuel, mixture, throttle, aux pump, mags, restart. D=Declare I state that I am over the field so I don't waste time switching to squawk 7700 instead I would announce on CTAF at the field since that is where I was tuned. E= exit strategy......I am landing this bird so I hold off on this step to concentrate on adding flaps and a getting there. I did slip a bit to loose some alt. And I was told that will be a bust on the checkride, instead I was advised to acknowledge the placard but explain the emergency situation and getting on the ground. Another lesson learned. As I am about to flair I am told to go around..... Remember that starts to feel comment? Well big time brain fart, full throttle, level, airspeed climbing take out notch of flaps, then I forget to make for best angle of climb speed 60 kts. Instead after positive airspeed climb I took out a second notch of flaps............UGHhhhhh not pretty, felt stupid. We worked on this a few more times until I was smoooooth. Yes, that's on the agenda for practice tomorrow. All in all not to bad for 3 weeks off. I will go at it tomorrow and Sunday to get back in the swing of it. It felt really great getting back in 46C. My CFI did not let me leave until we scheduled the mock checkride (July 13th 8:30 am) and oral test prep/ground school (July 13th 5:30 pm). I am calling to schedule my checkride on the 17th or 18th. Yes, I am nervous, worried about the oral and not screwing up the flight portion with any brain farts. I have read over the forums that your CFI will not "turn you loose" unless they feel your ready....God I hope so. Now where did I leave that rosary? One sad note tonight is a follow up with our Italian Mastiff, Maggie. While playing "wild hair game" this morning she made a loop around the dining room and charged up the stairs then down only to blow out her ACL. Yes, i said ACL, unreal, she can't put any weight on it and we just returned tonight from the vet clinic. She is looking at $2000 worth of surgery with a donor ligamnet and the weeks of therapy including pool time. Worse news...she also tore her right leg/knee ACL but for now that is holding. I guess 110 lbs jumping down 5-6 staris to the next level is not a good thing. More to follow.